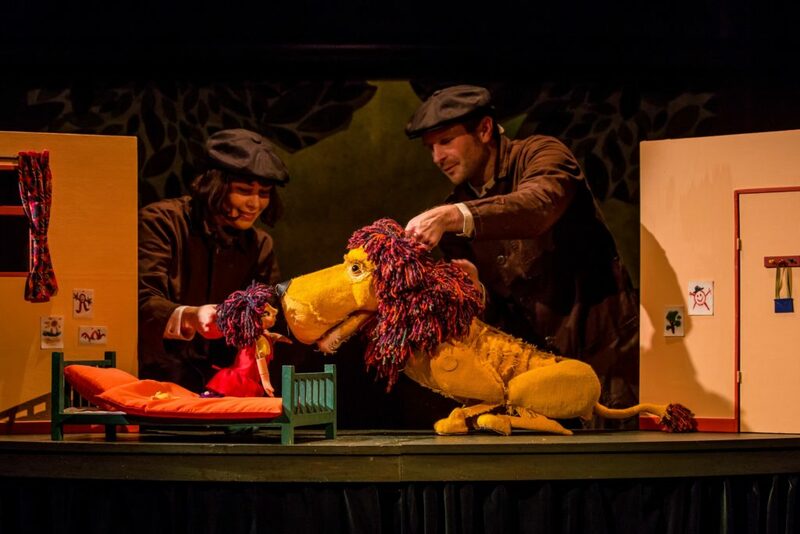 Family audiences across the UK can enjoy Pigtail Productions and Polka Theatre’s How to Hide a Lion this autumn, which uses puppetry to tell the story of a lion who goes to buy a hat and finds adventure. 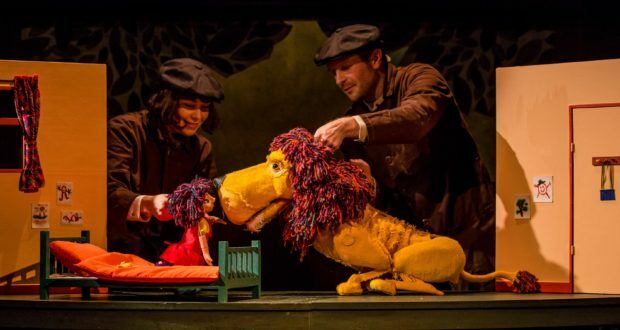 In this guest blog, adapter and director Peter Glanville shares how he and his team brought the whimsical puppet production to life. How To Hide A Lion by Helen Stephens is the tale of a lion who strolls into town to buy a hat. Though kind, everyone is frightened of him except a young girl called Iris who befriends him and hides him in her house. When her parents finally discover him, he runs off and ends up becoming the hero of the town, catching a robber and getting his hat. A friend told me about this book when my daughter, called Iris, was three years old. I bought it for her, she loved it and I began to fantasise about the theatrical possibilities. Having spent eight years as artistic director of the Little Angel Theatre, I have a love of puppetry, and immediately saw the potential for this to be a puppet theatre production, with a story that contrasts the personal and domestic with the communal and epic. Over several years I had clocked puppet designer/maker Sam Wyer’s rich imaginative work and particularly loved Alice Underground at The Vaults. I invited him and composer and lyricist Barb Jungr to join me for a week of research and development. Barb and I had created two previous musicals together, Fabulous Flutterbys and We’re Going On a Bear Hunt, which were both produced by Little Angel. What I’ve enjoyed in our artistic partnership is Barb’s understanding of not only how songs drive the narrative, but also how they can give space for the puppetry to breathe. Personally, I don’t think puppets work too well with loads of dialogue, but musically, the possibilities of responding to rhythm and atmosphere are rich. The songs also freeze time, allowing us to mine different dynamics and themes within the story. This is important; too many productions for children underestimate the perceptions of their audience, or resist challenging them. How To Hide a Lion clearly has echoes of the ‘fear of the outsider’ and is a tale for our time, in the midst of Brexit chaos and fan-flaming prejudice. Iris is the only one who sees the lion for what he is. The research and development period was fruitful. Inspired by memories of Michael Bentine’s work with small characters and objects, we created miniature townspeople who move en masse, including the Mayor, Baker, Sweep, Butcher and a flirtatious semi-professional Opera Singer. We shared our work with an audience of children and they loved these moments. “Middletown”, a Gilbert and Sullivan-style number from Barb, gave us freedom to explore some pacey choreography with the figures. Having explored the puppetry and the music in research and development, we then invited designer Laura McEwen to explore a world within which the story could sit. Laura came up with the idea of a hat shop, a framing device that allowed dramatic visual transformations to such places as a town square, bedroom, bathroom and garden. The puppeteers became Hattie and Horace, best friends who run the shop and begin by telling us that ‘every head needs a hat, and every hat tells the story’. The Hat, which the lion wandered into town to get, becomes the portal that takes us through to that story. I’m also indebted to the puppeteers I work with (currently Gilbert Taylor and Stephanie De Whalley). We’ve reworked the play recently for its UK tour, and there are so many detailed movement qualities and idiosyncrasies that are discovered when they work with the puppets anew, which subtly shift the inner lives of the characters and their relationships. 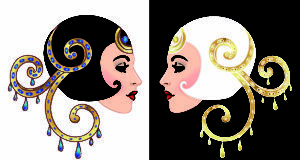 This development will continue throughout the tour, keeping the play fresh, unique for each audience and roaring with life. 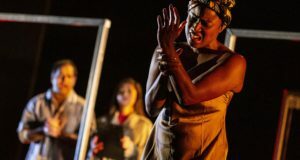 How To Hide A Lion is currently on tour until 18 November, including a London performance 4 November at artsdepot.